Update 10/23/14 – At the Planning Commission hearing the project was continued off calendar again. The Green Valley Road Community Alliance is requesting support in opposing this 46 acre Equestrian Event Facility (as planned) which is proposed for Green Valley Road/ Deer Valley Road area. It requires a rezone from current residential to recreation facilities, and a special use permit. Horse shows to take place unlimited times per year averaging 3-10 days. Hours of operation 7am – 9:30pm seven days a week. Below is a summary regarding another land development proposal with corresponding concerns that will bring significant traffic to Green Valley Road: A Springs Equestrian Center, Project #P 08 0036, on 153 acres, to be located south of GVR, off of Deer Valley Road. This is a proposal in an area that is zoned for Estate Residential Five-Acre (RE-5) and Estate Residential (RE-10); This proposal will substantially change the character of the area and result in a loss of privacy. The proposal is to board 420 horses, have two (2) covered arenas, three (3) 80 stall barns, one (1) 40 stall barn, and seven (7) 20 stall barns. Furthermore, it will encompass an eight (8) foot tall lighted monument sign, and up to 8,000 square feet of guest cottages available for weddings, seminars, meetings, and group functions not related to the equestrian activities as well as accommodations for those enrolled in the shows and paying fees and lodging. Added to all this is a camping area with hookups for horse trailers and recreational vehicles with up to 90 vehicles allowed to stay up to two weeks to coincide with two weeks of horse shows. The proposal also calls out for a retail store and a clubhouse with showers, spas, a salon, and lockers as well as exercise equipment. All this would be open from 7:00AM to 9:30PM, SEVEN DAYS A WEEK. The horse shows would be unlimited averaging 3-10 DAYS WITH UP TO 250 SPECTATORS, AND 300 PEOPLE ATTENDING. We apologize for this late notification. If you agree with the concerns below, please forward this email with your name at the bottom of the list of concerns and send to: aaron.mount@edcgov.us (planning commissioner reviewing Springs Equestrian Center) and John R Knight, Supervisor District 1, at bosone@edcgov.us. Be sure to ask for a return receipt showing they received it. This will add significantly to the traffic on Green Valley Road of which is already traffic laden with approved projects and pending projects projected to add more traffic. We oppose this project as it is being proposed as it creates several problems for the surrounding residents. 1. Traffic – They state that the “proposed project would worsen traffic”. They want to use the Dear Valley Entrance which is the only access to many ranches and homes. This is a two-car country road. 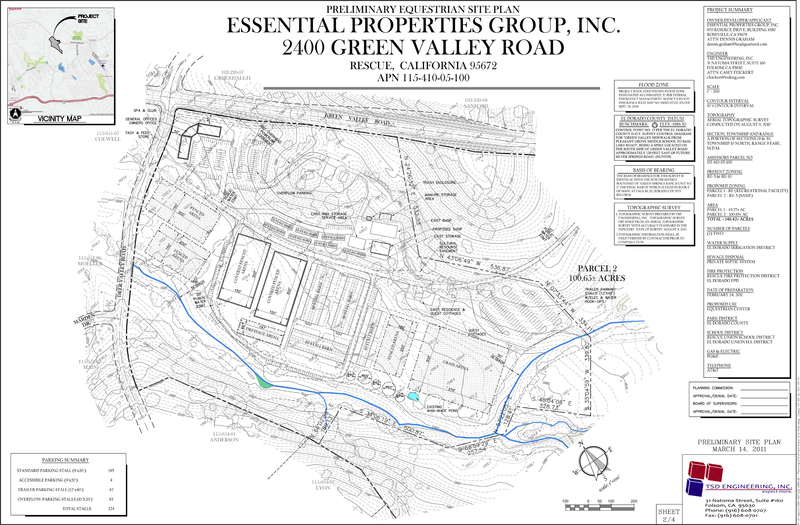 The proposed equestrian center is approximately 500 feet from Green Valley Road. There is no signal light or stop sign on Green Valley Road. There is no plan for a secondary or access road that can be used to relieve traffic and noise of vehicles. Also, once the Silva Valley Parkway exchange to Highway 99/Elk Grove is completed, traffic from the central valley will overwhelm EDH when added to that of Dixon Ranch and other traffic emanating from other new developments along Green Valley Road. 2. The Noise that this amount of people, cars, events, and camping area would make would destroy the peace and quiet of the surrounding residents. The proposal calls for loud speakers to be set up for announcements during all activities. Further it calls for music to be played over these amplified speakers, guests speaking and loud cheering in raised voices. 3. Parking would be tremendous. They have presented a plan for the proposed 324 spaces they will need daily for people who are staying there. This again supports the fact of the increased traffic on Green Valley Road and the surrounding small rural roads. 4. There is no environmental impact study. What kind of impact will this have on the ancient Indian grounds? What kind of impact on the flora? What about the open spaces? Local water well contamination and impacts on other major water resources have yet to be analysed; the property drains to Folsom Lake. They will have to use a septic system! Is the septic system adequate as proposed? Where will it be located? This type of massive project will result in destroying the beauty, causing the wild animals to leave the area, and corrode the purpose of this wide open expanse. 5. Lighting is another problem. Will the local residents have to look at bright lights glaring in their homes and backyards? The type of lighting required at night for both the shows and the camping facilities would have to be tremendous affecting anyone immediately adjacent to the center. Even if the Equestrian Center control their lights, will all the campers/motorhomes/cars have to turn off their lights after 10:00PM? 6. The project site is surrounded by land designated and utilized for low-density and rural residential uses on three sides and is adjacent to a middle school on the other. A business endeavor such as the proposed equestrian center would destroy the intent and meaning of the area. The residents would definitely lose their quiet enjoyment of their homes. All the residents in the area moved there to get away from congestion and noise. Certainly the proposed equestrian center is in direct opposition to our need for quiet enjoyment of the country. 7. Many of us have our life savings in our homes. Due to the recent recession, we’ve lost a lot of value and are looking forward to recovering that value in the coming years as the economy improves. We believe the impact of this massive equestrian center steals from investment and dreams of the current residents. The noise, congestion, constant traffic, and odor emanating from all the animals would deter most buyers. In Summary: If Mr. Graham, the owner/developer wishes to put in such a massive business enterprises, he needs to pick an area that is already zoned for that. If he wishes to put in a small, quiet equestrian center as originally proposed, this would be considered a much better alternative in this low density rural residential neighborhood. What is not acceptable is massive lighting, thousands of attendees, being open from7am to 10pm, 7 days a week, weddings, seminars, loud speakers, and congestion of traffic.